Note: We will not rip anything that is less than 30 seconds (unless it’s a ringtone!) Be reasonable! Jeff: We’re teaming up to make the best What’s Up soundtrack compilation that will be found on the Internet! If you have any info that can help us with naming songs, just tell us in the comments below! Alice: ha! Yea, we’re ambitious and fierce like that. =P Welcome to my world! 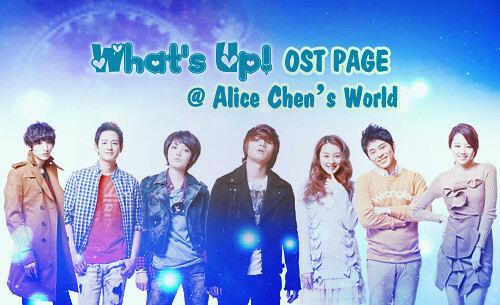 This entry was posted in Soundtracks and tagged Im Joo Eun, Im Joo Hwan, Kang Dae Sung, Kim Ji Won, OST, What's Up by Kappy. Bookmark the permalink. Hi, thanks for all your work. I couldn´t found this songs in other place. Can I request the full duet of ep.12? Because there is only Tae Hee part and I really love Byung’s voice. Thank you for your hard work! I will be downloading everything. Also, I tried the wupload link but only the owner can download it. I recommend mediafire? Why can’t download You & I ???? and if you could, upload in mediafire will be the best load for me..
please reupload again..it doesn’t work..
It’s “Les choristes (Look Upon Your Path) – Vois Sur Ton Chemin “. French song. u’re welcome. Here’s the song at the credits. This is really good but hard to find. Does anyone know what song the voice professor sings, about spring sunset or something? What is the name of this song please?